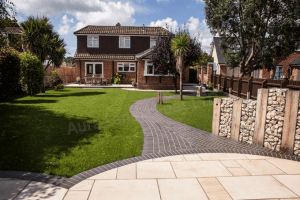 Paving vs Decking – Which is best? More and more homeowners are deciding to invest in their outdoor areas. They know, by doing so, they can create areas to relax in and socialise in, whilst also having the piece in mind in knowing, that if one day they decide to sell their property, the landscaped garden will have added tons of value to their property. But, deciding to invest in your garden is a big decision – you are spending money and want to ensure that you are completely happy with the end result the first time around. Two popular options for homeowners looking to create a beautiful garden area, is to install patio paving or decking. Below, we explore why both options should be considered when thinking about investing in your garden area. Patio areas are ideal for homeowners who seek a low maintenance area that they can socialise and relax in. With a wide variety of paving, you can now find paving to match your taste and other needs. If you didn’t know, landscaped patio areas can also add tons of value to properties. According to a 2007 survey by the National Association of Realtors, patios were in the top 10 features that buyers looked for in a new house. More than half of the buyers said that they would pay a premium for a house with a patio. Installing decking is also becoming more popular. Decking areas can also provide relaxing areas to socialise in and dine in. Installing decking is often quicker and easier than paving, especially if raised above ground level. What’s more, it may also be slightly less expensive than paving. Although, it depends on the kind of wood you choose. Low maintenance garden areas are becoming increasingly sought after, so you’ll be pleased to know patio and decking areas don’t require much attention. However, you may need to sweep the patio area from time to time (to keep it looking tip top!). Occasionally, you will need to oil the decking to ensure it keeps its brown colour. Whether you decide to go for paving or decking (or even both! ), make sure you are careful when choosing a landscaper. Check that they are approved by companies such as BALI, APL and Marshalls. This will ensure you don’t hire a ‘rogue trader’. Have a look at our Garden Transformations page to see some of our garden projects.